Thanks to retired, Chicago Police Homicide Sergeant Johnny “North side” Northern, I was taken back more than three decades. North Side worked at Area Six in another now demolished building located at Damen Avenue and Grace Street. 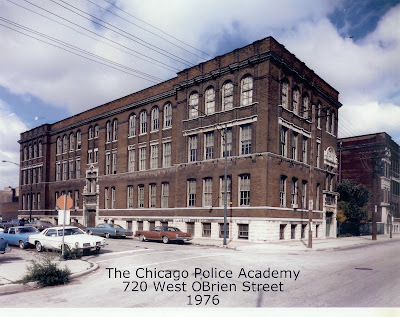 North Side sent me this picture of the old Chicago police Academy. The non-descript building was used as a hospital during the Civil War and has the look of so many of Chicago’s public grammar schools. I guess one architect had the clout to design so many buildings during that period. I wonder whose political campaign he had to fund to get the job? The building served the city well for a very long time. I can remember every day I spent in that building that had no air conditioning but for a single window unit in the training director’s office. Rank has its privilege. The classrooms were large and noisy. You could smell the Vienna Sausage Company’s products in the air from several nearby hot dog stands on Maxwell Street. The sound of a fellow recruit’s wrist snapping still rings in my ears from the great training provided by a certain notorious defensive tactics instructor. The boiler room was used as small running track where we did the Duck Walk for many miles before we graduated. Compared to my basic training at Fort Leonard Wood in Missouri the O’Brien Street Academy was an absolute country club. The instructors were the greatest as they gave me the building blocks to understand the job and also help me through a second career as a private eye. The new academy on Jackson Street was finished the same year this picture was taken. It was new, modern much larger and lacked so much personality that the old school had. Strange, I instructed there in 73 and we moved into the new academy in 1975. Just a mix up in dates. Also in 73,at 720 Obrien we had the first large influx of women PO's that went into Patrol instead of Youth Division Diaper Patrol.